Today marks the anniversary of the death of Jean-Antoine Houdon. A sculptor of no small note, Houdon enjoyed enormous success both before and after the French Revolution, though he fell from favour during those turbulent intervening years. A graduate of the Académie Royale de Peinture et de Sculpture, Houdon became known for his busts of famed figures including monarchs, philosophers and even American Presidents! Despite his fashionable popularity and renown, Houdon scandalised polite society in 1783 when he unveiled his work entitled, La Frileuse, or, Winter. The figure depicts a young, naked woman, draped only in a shawl that does little to cover her, posing before a classical urn and supported against the trunk of a tree. Initially worked out in terracotta and then carved in marble, in 1785, Houdon submitted the work to the Académie for its salon and found it rejected though there was a grudging suggestion that it might be placed in a corner somewhere, hopefully to hide the young lady's buttocks! It is certainly a unique depiction of the season even today and no less eye-catching, though perhaps we have grown a little more difficult to scandalise. In 1787 Houdon returned to the subject and cast a bronze version of the work for the duc d'Orleans, this time removing the tree trunk and urn and leaving her even more starkly exposed. Houdon made several copies of the silvering, vulnerable figure, as did a number of other sculptors, much to his annoyance. 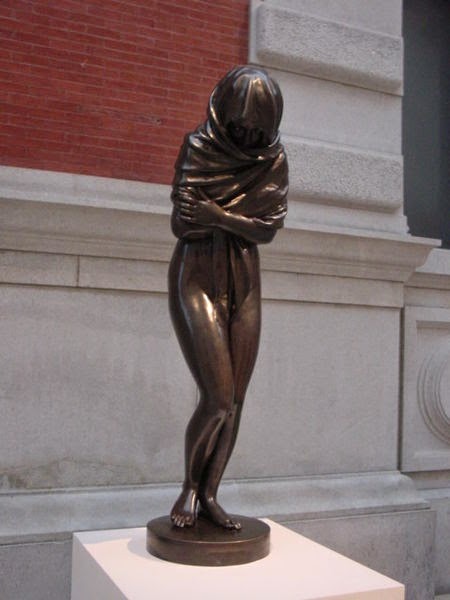 However, the original, scandalous inspiration definitely belonged to Jean-Antoine Houdon. It is lovely! But I am utterly scandalized. Her scarf must be keeping all the heat in! It looks so modern, if you had said it was Art Deco it would have been plausible. It does, doesn't it? I must admit, I love it. I think I actually know what you mean! Such a modern piece for the time! Could be analysed in so many ways! Could be a modern statue, to bring to our attention the vast number of young girls who are still being exploited.